So, apparently there are two ways to serve Butter Beer. Iced (slush type) or not iced (Soda base with whipped cream on top). As I found out on vacation at Universal, you are not supposed to mix up the non-iced version. Something in whipped cream, I'm guessing the high amount of sugar, causes the carbonation to go crazy and it can bubble out of the cup. This is not the best way to enjoy it. The best way is the iced version. Mix up with whipped cream into the soda and enjoy! Butter beer is a cream soda base, not root beer, with a loosely whipped, butterscotch whipped cream layered on top. Its a very sweet treat; think i had 2 a day while I was there. 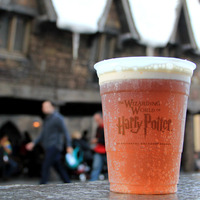 This is what I modeled my Butter Beer after. You get a sweet cream soda, not fizzy, followed by a butterscotch, vanilla flavored whipped cream that lingers on the tongue after. CAP - Vanilla Whipped Cream: Gives the heavy cream feel from the whipped cream layer on top. FW - Butterscotch: I went back and forth with this and FW - Butterscotch Ripple. They are both very good. I went with butterscotch because it had a more butterscotchy taste, not a lot of cream to take away from it. I needed a pronounced butterscotch here. Ripple is too creamy and lacks the butterscotch feel I was looking for. FW - Butter Rum: I went with this to add a little more depth with the butterscotch. Again, Ripple was a contender here, but I feel it just was too creamy and the Butter Rum, SLIGHT rum I get plays well and fades into the cream soda, leaving you with a more complex butterscotch. Butter rum has a tad more brown sugar taste to me vs Ripple as well, so I went with this one. I never worked with FW - Butterscotch (Natural). Its a rich, creamy butterscotch but again, I didnt worry about it because I didnt want this recipe to become too creamy and take away from the butterscotch, or overpower the whipped cream profile either. I believe this is a VERY close to the drink I had in Orlando, which is what I wanted to model it after. I was lucky enough to have the reference to model it after. The Super Sweet is something you can change of course on your own, but this is meant to be a sweet treat, drop it if you like to get the flavor which is a somewhat subtly sweet mix as it is. Can also add Koolada or ws-23 at a super low % to get a cooling effect of it being an iced drink. I didn't use it, but it is something you can do as well. This is a pretty good shake and vape, but the steep gives it a MUCH better flavor. This recipe is the property of SlashaLO and released under the CC Attribution-NonCommercial-NoDerivatives 4.0 license. You may not copy, derive or commercialize this recipe without following the terms of this license or the explicit permission of the creator. Definitely not an ADV for me but its a solid recipe for sure. Actually brings me back to when I was a kid, reading the Harry Potter books and wondering what the hell Butter Beer tasted like. I must say this is not far off at all. Its nice and smooth and that butterscotch with the whipped cream really adds a nice full and velvety mouthfeel. Unfortunately, with the cream soda concentrate (actually with most RF-SC) I pick up a bit of dryness, especially off the shake. Actually its more of a club soda vibe, however, after testing and steeping this for a month, that stronger club soda vibe has improved into a mildly carbonated diet cream soda. I would love to mix this again but maybe sub out the RF for one of the new cream soda flavors that have come out recently. Perhaps even adding 0.5% of Vanilla Shisha would do the trick. Anyways, I believe this is a killer drink recipe and a must mix for anyone that loves butterscotch or unique drink recipes. So, made this in honor of September 1, and have been vaping it to the recommended 5th day and beyond. The whole ride has been sweet, buttery, creamy, with the vanilla adding in that perfect touch of flavor. Rich, smooth, brilliant at 420F in tc, this is the stuff I always imagined awaited me at Madam Rosemerta's Three Broomsticks. No more waiting for a Hogsmeade weekend. Tell Forge and Gred to stay the hell in the tower, cos you don't need to smuggle it in anymore. You straight out saved me a trip to Universal. Mischief Managed, dude. Beauty! P.S. Added in 5 drops of WS-23 to the last 10 ml cos i like it cool, and holy hell. Icy, chilly, but brightened the vanilla and butterscotch significantly. Would recommend maybe 1-2 drops for most fans of cool beverages, but worth trying! I've never had butter beer to judge whether this is the real deal, but it seems accurate to the rich, creamy, and sweet description given and even has a terrific thick-drink mouthfeel. Goes down velvety smooth and reminds me of something you'd get at Starbucks, but with vanilla cream soda instead of coffee. The only beef I have with it is the 0.5% Super Sweet. It leaves a Spenda-esque aftertaste that bugs me; I bet this would be even better with the Super Sweet reduced to 0.25 to 0.3%. OMG this is fkn amazing and spot on! I cannot get enough of this recipe, when you vape it you can really feel a beer or soda type feel with the bubbles and everything. Creamy and sweet just like its supposed to be! This is definitely one of my new fav's and ADV as well! Oh and the added bonus is this is even good as an S&V as well! This stuff is really good man, you can't go wrong with FW butterscotch it is such an amazing flavor. Great job on this juice.